There's something about the weekend that always makes my sewing time so much more productive than the average weekday. It's all thanks to my husband - he really is such an attentive dad and never minds taking over with the kids so that I can accmplish some things. People often ask me, "How do you get so much quilting done?" One of the main reasons is that I have a husband who knows I need a break and he supports me. I finished this fun and simple quilt that I am going to call "Donkey Crawl." It is a pattern called, "Cub Crawl," from the book: Fat Quarterly Shape Workshop for Quilters. 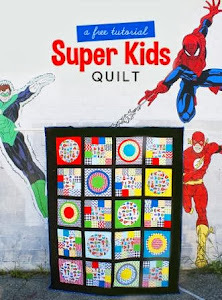 I am always in favor of simple quilts for kids and this design is so quick to put together that it lends itself to lots of free motion quilting practice. I did a different FMQ design in each solid frame for the donkey and boot blocks. Even though I am not a huge fan of solids, I definitely appreciate their appeal for quilting- so much of quilting designs get lost in prints. I am on a roll with finishing all of these WIPs- but I am aching to start some new things! In about one more week, I am going to let myself dive into some new projects. This came out great! I hate when patterns are off a bit. I suppose it was better that you had too many than not enough. I've had it happen where I ran out of fabric because the pattern was a bit off. Good for you for finishing up some WIPs. And you don't need to tell me about hoarding precious fabrics. My biggest WIP is my sewing room. I need some of your will power. 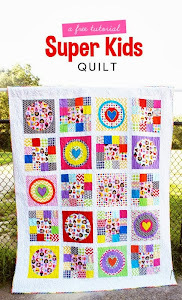 You know I always love a pink & green quilt:-) So fabulous and the quilting is awesome!! !